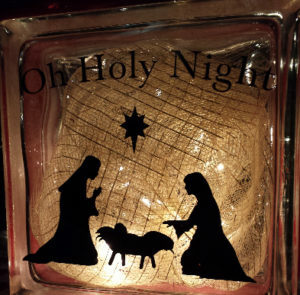 Christmas time is a wonderful opportunity to create decorations for your home, friends and loved ones. You can find a very wide range of affordable decals for glass blocks on Etsy, including my Etsy shop, All I Make. I created this glass block with vinyl using glass blocks we found on Craigs List and the a vinyl decal found in my Etsy shop. We were able to get glass block cheap, so we found a drill bit at Lowe’s to drill into the back of the blocks to insert the mesh and lights in the block. You can also find the blocks ready to decorate at your favorite craft store, especially around Christmas time. 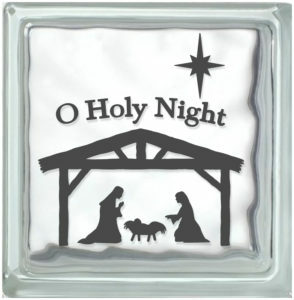 Vinyl Decal to fit the glass block, O Holy Night used in featured project. When ordering vinyl, you will want to have your glass block so it can be measured before ordering. The glass blocks I had, have a decorative edge around them, so you will want to measure within this area where you want to decal to fit. When you order a cut decal, it will come to the size you ordered so it is important to accurately measure the design area only. I like to order about 2 inches smaller than the glass block. If you have questions regarding the decal and you are ordering from my Etsy shop, don’t be afraid to send a convo by clicking on the contact button to make sure you are clear on what you are ordering. I will also do customization of existing decals or create a custom design for you. Around Christmas or busy season, custom work may be limited so make sure you plan ahead. Depending on the size of hole there is in the glass block, inserting the lights and mesh can be tricky. I like to wrap the mesh around the light to not only stiffen the mesh but also distribute the lights so they are not bunched in one area. You can also concentrate the lights in one area for added affect. For a finishing tough, tie a bow around the glass block to finish off the sides.